If you have bought Ferragamo shoes recently, fancy footwear was not all that came in the box. Inserted in the left shoe’s sole is a passive radio-frequency identification (RFID) tag. A transmitter-receiver known as an interrogator can send a signal to the tag and read its response. Only genuine Ferragamo shoes send back the correct one. The RFIDs are the Italian shoemaker’s latest weapon in its campaign to protect its brand from fakes. Last year alone, the company says, it took down tens of thousands of ads for fakes bearing its label from online auction sites, and recovered or revoked 140 domain names and websites which, it argued, infringed its copyright, most of them belonging to Chinese people or firms. It has long been known that counterfeiting and piracy (respectively the infringement of trademarks and copyright, together known as intellectual property, or IP) make up a vast global business. But a report published on April 18th by the OECD suggests that, despite the advent of such high-tech counter-measures, it is far bigger than previously thought. The last such survey by the club of 34 mostly rich countries was in 2008. Updated the next year with data from 2007, it put the value of cross-border trade in fakes at $250 billion, or 1.8% of the total for all goods. The latest report estimates that by 2013 those figures had risen to $461 billion, and 2.5%. Some increase was predictable: global trade has recovered since the financial crisis, and it is natural that illicit commerce should, too. But, says Piotr Stryszowski, the report’s lead author, he had not expected the rise in percentage terms to be so high. In part, it could be thanks to better data. Mr Stryszowski likens the difference in quality between today’s figures and those on hand in 2007 to that “between a communist-era Polish Fiat and a Lamborghini”. But he thinks the rise is real, nonetheless. Branded, knowledge-based products make up an increasing share of the global economy. And the rise of e-commerce has made selling and transporting fakes much easier: almost two-thirds of seizures nowadays are of postal shipments, mostly of goods bought online. Counterfeiting and piracy cover an immense gamut: from synthetic cinnamon to fake Louis Vuitton luggage to copies of the world’s most elaborately programmed computer software. Some manufacturers and distributors are out-and-out hoodlums: investigations in America, Canada and Sweden have linked biker gangs to counterfeit medicines, notably drugs used to treat erectile dysfunction. Others are guileful entrepreneurs who would doubtless shrink from other areas of organised crime. A Chinese woman accused of selling bogus branded luxury goods worth millions of dollars was found last year to be living in a quiet Californian suburb, studying for a university degree. Measured by the number of customs seizures, footwear was the most-affected industry in each of the three years studied by the OECD, from 2011 to 2013. Other popular items to rip off included clothing, electrical equipment, leather goods and watches. The country that suffers most from trademark infringement is, of course, America. Next is Italy, a country long notorious for making sham products, but which is also home to many of the world’s most envied brands. Globalisation has enabled traffickers to run rings round officialdom, says Candice Li, vice-president of the International Anti-Counterfeiting Coalition (IACC), a lobby group. “There isn’t an international legal or enforcement framework with which to confront the problem,” she says. Counterfeiters can make parts in one country, assemble a product in a second and package it in a third—without stepping outside the law in any of them. 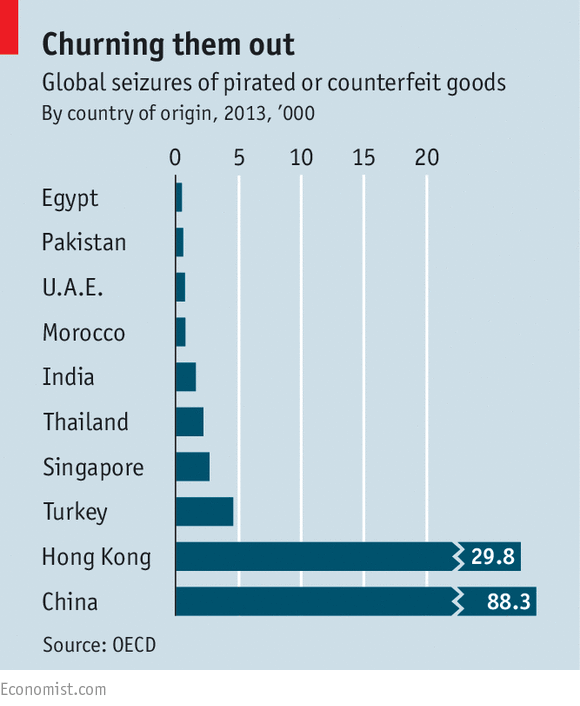 Establishing the origins of internationally traded counterfeit or pirated goods is not easy. Distributors go to great lengths to zig-zag around the world. A consignment of counterfeit versions of Avastin, a cancer drug, found in America in 2012 had travelled through Turkey, Switzerland, Denmark and Britain. Free-trade zones are particularly favoured as transit points—as are poorly governed or war-torn countries. Afghanistan, Syria and Yemen are all leading countries of provenance. Even so, the data from seizures support Mr Stryszowski’s conclusion that “China is the super-producer in almost every sector”. Including Hong Kong, it was the origin in 84% of cases (see chart). For comparison, in 2013 its share of global manufactured exports was only 17%. Another report released this month, by the American customs bureau, also named China as the primary source, saying it accounted for more than half of the $1.35 billion-worth of fake products the bureau had seized in the most recent tax year. Occasionally, Chinese customers fall victim to foreign fraudsters: Chinese wine collectors were prime targets for the most famous producer of bogus rare and fine wines, Rudy Kurniawan. An Indonesian living in Los Angeles, Mr Kurniawan mixed his brew in his kitchen sink and printed fake versions of the labels of winemakers such as Château Pétrus on his computer. He is appealing against a ten-year sentence for fraud and one other offence. When China joined the World Trade Organisation nearly 15 years ago, hopes were high that it would crack down on IP violation—especially as its economy developed and more Chinese firms and artists had valuable trademarks, patents and copyrights to protect. Surely, the argument went, Chinese enforcement would improve when Chinese firms were being ripped off as well as Hollywood film studios and Italian fashion houses? And indeed Chinese entrepreneurs are gradually becoming victims as their brands acquire lustre. But the seizure of fakes masquerading as Chinese brands still accounts for barely 1% of the global total. And strolling the streets and market stalls of Beijing, where pirated DVDs and bogus Rolexes abound, it is clear that Chinese consumers are themselves often duped into buying fakes (or, like consumers elsewhere, knowingly buy good imitations because they are cheaper). In just the latest scandal, China’s food regulator said earlier this month that a rogue factory had produced 17,000 tins of counterfeit brand-name infant milk powder and distributed them nationwide. Visiting America this month Zhang Xiangchen, China’s deputy international-trade representative, said that the very concept of intellectual-property rights was relatively new to China and—an understatement—there remained “a lot of room for improvement”. In fact there has been some progress. Surveys find that foreign firms in China continue to name IP violations as one of the top constraints on their operations. But many respondents also say that enforcement has improved in recent years. According to legal experts, China’s supreme court and senior prosecutors are taking the issue more seriously, and have streamlined procedures for accepting cases, including those brought by foreign firms. Police sometimes make a great show of burning, crushing or steamrollering seized counterfeit goods. Wang Yang, a deputy prime minister, said last month that tackling piracy was essential if China is to become an innovation-driven economy. He promised a crackdown on fake agricultural equipment and pirated software, and greater scrutiny of exports. Holders of intellectual-property rights argue that fakery discourages innovation, diddles the taxman and funds terrorism (though hard evidence of links between terrorists and counterfeiters is elusive). But many in the developing world see strict IP laws as a way of keeping poor countries down. The argument gets especially heated when it comes to pharmaceuticals. Governments in poor countries, and NGOs, argue that the poor cannot afford costly Western patented drugs and should be allowed to buy cheap copies even before the patents expire. An attempt in 2006 to frame a global approach to counterfeit medicines foundered on resistance from India and Brazil. The World Health Organisation (WHO) has since limited the definition of counterfeit drugs to those “deliberately and fraudulently mislabelled”, rather than those competently made without the consent of the inventor. Pills that are bogus by the WHO’s definition are often useless or dangerous. Most contain the wrong ingredients, incorrect quantities of the right ingredients or, in about a third of cases, none of the listed active ingredients at all. In 1995 bogus meningitis vaccines led to the deaths of more than 2,500 people in Niger. Not only medicines, but other fakes, such as vehicle brake parts and pesticides, can be lethal. Falsely branding merchandise is theft. It erodes the brand-owner’s profits or, if the goods are poorly made, its reputation. 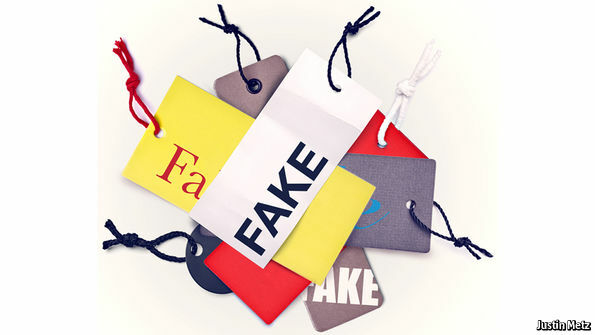 However, fakes can also build brand awareness. As people in emerging markets grow richer, more of them will doubtless upgrade to the real thing. For software, in particular, fake copies are as good as real ones at building brand loyalty, squeezing out the competition and creating a de facto standard. That may help explain why firms have been slow to exploit new technologies that could allow consumers to differentiate between genuine products and rip-offs with a click of their smartphones. The most important recent development in the war on fakes has come from a different direction. On April 13th Alibaba, China’s biggest online retailer and, until now, the marketplace of choice for many Chinese producers of counterfeits, joined the IACC. Two years earlier Jack Ma, the firm’s founder and boss, had called counterfeit goods a “cancer” and vowed to fight them. The new partnership—the first between the anti-counterfeiting group and an online retailer—suggests he is serious. But powerful opposing forces are still at work. For Chinese local-government officials, who are responsible for providing health care, pensions, housing and so on, enforcing intellectual-property laws is hardly a priority. And because they are evaluated almost exclusively by their economic performance, it is easy to see why many tolerate a factory that employs workers and pays tax—even if it steals other people’s intellectual property.